Northwood College for Girls provides a safe and happy environment set within a culture of wellbeing, trust and respect for oneself and those around us. Academic achievement is achieved within the broader development of the whole person – social, cultural, spiritual and physical as well as intellectual. Emphasis is placed on moral development – values that serve as a life-long moral compass. As well as ensuring that each girl achieves the highest possible academic standards, each and every one of our girls are thoroughly looked after through the strength of our outstanding pastoral system. Initial care lies with the Form Teacher whose knowledge of the girls in her care is exceptional. Our Junior School Council provides a forum for the girls to express their ideas and opinions about school life, while an active House system encourages participation in academic, musical and sporting activities, and helps to promote both good behaviour and a sense of collegiality across the age groups. Girls are encouraged to develop a sense of responsibility by holding offices such as Form Captain, and residential trips are arranged to both support academic studies and to develop independence. Regular charity events and fund raising initiatives encourage a sense of awareness of the needs of others. Together, we celebrate success in all its forms and encourage our girls to strive to be better, but we also support them through life’s inevitable setbacks or failures. Our approach helps girls develop a strong sense of self-esteem and responsibility towards themselves and others and the wider world around them. 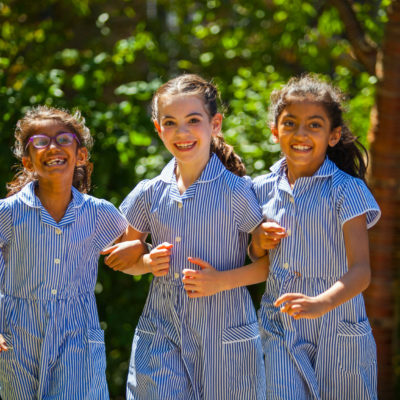 Pupils throughout the school benefit from participating in ‘Positive’ which is an exciting GDST- wide initiative, developed by doctors and child neurologists to enhance pupil well- being, emotional resilience and positive mental health through the use of age appropriate activities and tools. This runs side by side with our Junior School Resilience Programme, an integral part of the Northwood College for Girls’ curriculum offer. In Junior School the foundations are laid for positive mental health, as pupils start to learn the skills and tools which will stand them in good stead for when they later navigate their way through the teenage years and beyond. ‘Positive’ teaches girls to learn from mistakes and to embrace, rather than avoid, new challenges. Junior School girls are rewarded for exceptional achievement, effort and admirable personal qualities through our unique, colourful superhero capes which they can wear for the day. Girls are encouraged to take pride in their achievements, feel confident and empowered. Each form has one designated lesson per week but pupil well-being issues are dealt with throughout the school day, not necessarily in lesson time. Pupil well-being lessons take the form of discussions, debates, role play and circle time. Each girl is a member of a Form and of a House. Through the House system there is frequent contact with older and younger girls and these links across the school years are an important part of our community. The House system fosters a sense of belonging, creates opportunities for leadership and is part of our pastoral care structure. It is also the source of fierce competition on the sports field and elsewhere, where girls can win points towards the annual House Cup or other House events. Sisters are always allocated to the same House and we normally accommodate special requests to join a particular house for historical family reasons, as we have a long tradition of daughters, nieces and cousins attending Northwood College. In accordance with our Admissions Policy, prospective pupils are assessed on the basis of their academic suitability for the school. Our admissions criteria and policy will not disadvantage applicants with special educational needs or disabilities. Discussions about the support required for such pupils will be independent of the admissions assessment. Where a girl has already been identified with a specific learning difficulty and/or disability and is normally allowed special arrangements in exams, the school will follow the The London 11+ Consortium Guidelines. Parents are requested to forward relevant reports to the Registrar who will pass them to the SENCo to confirm the pupil’s eligibility for exam access arrangements.